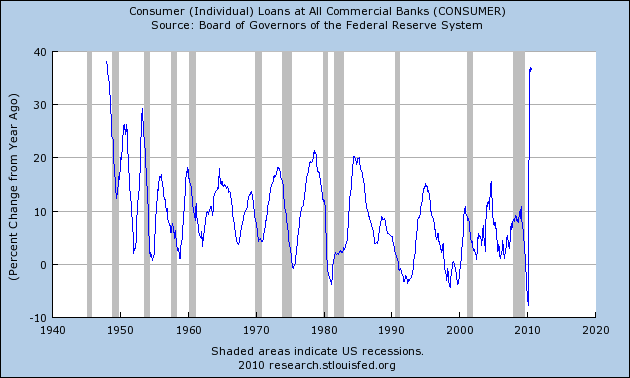 The US economy may be in for the dreaded double dip, consumer loan data indicates. Recording the sharpest spike since data collection began, consumers extended their credit by almost 36% YOY by August 2010. 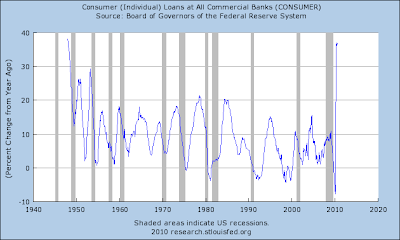 While the absolute growth of almost $400 billion YOY looks astounding by itself in the context of consumers tightening their belts the annual rate of change signals another recession ahead based on historical observations in the chart below. 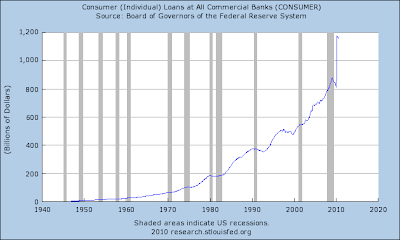 GRAPH: US consumer loans expanded more than 42% since the beginning of 2010 and 36% YOY. 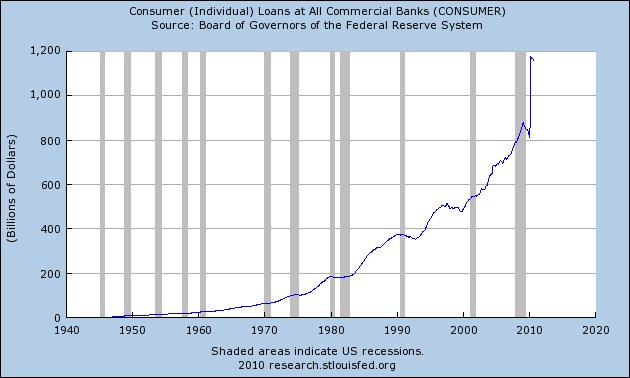 The chart above shows that consumer never before took out so much debt in history. All rapid credit expansions preceded a recession in post WW2 times. So I would not be too bullish that the praised US consumer, responsible for roughly 70% of US GDP, will be able to pull the sluggish US economy out of the ditches. Growth forecasts have become a tricky issue with big names now changing their GDP forecasts on an almost weekly basis. GRAPH: Outstanding consumer loans jumped from $813 billion to $1.16 Trillion since the beginning of 2010 but even this explosive expansion failed to pull the US decisively out of recession danger. The latest GDP growth figure for Q2 was a mere 1.6%.